Posted 29th October 2018 & filed under Blog. In April of this year, a shocking statistic revealed that London’s murder rate exceeded that of New York in 2018. What followed was a series of broadsheet and online articles that attempted to draw links between a rise in knife crime and government cuts to youth services. Now once again the horror stories are appearing on the front pages of our newspapers. And yet there is no sustained or broader assessment of why these crimes occur. It seems as if there is little imperative for mainstream media to conduct a serious investigation into the relationship between cuts and a rise in this particular kind of violence. The current reporting of these crimes largely ignores the way young people involved in knife crime have been failed by the system. “Gang culture” is used as a catch-all phrase designed to limit questioning. Obviously people are responsible for their own actions and should be held accountable. However, most of the reporting dehumanises both the victim and the perpetrator, peddling a governmental agenda by ignoring the material reasons why young people are prepared to carry a knife in the first place. Youth services have borne the brunt of the Conservative government’s austerity measures. Government spending on youth services in England and Wales has fallen by 61% over the past six years according to the YMCA. Similarly, spending on youth services by local authorities is down by a third compared with three years ago in 2015. Youth services include youth workers, youth clubs or even advice for young people. Advice might be offered, for example, in how to gain employment, find housing or gain qualifications. Youth workers and youth clubs provide a support network and an infrastructure for young people so that they feel included and valued within society. Without this infrastructure, especially vital for those from a low socio-economic background with less opportunity, is it much of a surprise that people feel excluded and at odds with society? According to both the World Health Organisation and the Centre for Crime and Justice Studies, violence is symptomatic of this feeling of exclusion and social inequality. Describing “gang culture” as a cause of knife crime is not enough, uncovering only part of the story. For starters, the Metropolitan Police estimate that 75% of those found with a knife in London have no relation to gangs. We must also recognise that gangs fill a void when no other opportunities out of difficult circumstances are offered. The trade union Unison has discovered that between April 2010 and April 2016 £387m was cut from youth service spending across the UK and this figure has only got worse in the past two years. From 2010 to 2016 the average London council had its youth service budget slashed by an average of 36%. Not being part of the statutory obligations of local authorities (unlike social care and the provision of school places, for example) youth services have consistently been among the things to suffer budget cuts when austerity measures bite. Young people with low or no income were always going to be hit the hardest as education maintenance grants were slashed, and families lost child tax credits, child benefit and housing benefits. As a result, social mobility is stunted and young people feel alienated. The Institute for Fiscal Studies has projected that absolute child poverty will increase by around 4 percentage points between 2015/16 and 2021/22. Around three-quarters of that increase (about 400,000 children) is ascribable to benefit changes. In contrast, absolute poverty is expected to remain the same across the population, demonstrating the unequal treatment between age groups. Throughout 2017, 36% of knife and offensive weapon crimes resulted in an immediate prison sentence, which is the highest proportion on record. Rory Stewart, the justice minister, remarked that “These figures show we are catching and prosecuting more of those carrying a blade, and we are sending them to prison for longer.” Stewart argues that “We need sentences that punish anyone who commits knife crime and deters anyone from doing it in the future.” Seemingly as an afterthought, he added that they “are also working to prevent young people from ever picking up a knife in the first place.” Stewart’s comments convey the idea that harsher and longer prison sentences are the answer to rising knife crime. This is symptomatic of the habit of the government and most reporting to ignore the ways in which those carrying knives have been repeatedly failed by the government for years prior. Craig Pinkney, a criminologist and academic who works with at-risk young people says that “sentencing should be seen as one part of the solution.” This view is especially pertinent considering that nearly 30% of those convicted of a crime go on to reoffend. This statistic is even worse among young offenders, with a reoffending rate of 42% among 15–17-year-olds. In 2016, 68.1% of all convicted juvenile offenders went on to reoffend, and on average, they reoffended five times or more. These statistics speak for themselves. It is naive (at best) of a government to foster the circumstances of societal exclusion and a lack of hope and opportunity for young – especially poor, young – people, and then expect that harsh punishments will counteract their own systematic failing of young people. 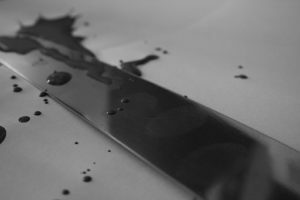 Last September, as the number of knife crime fatalities kept climbing, London Mayor Sadiq Khan announced the creation of London’s Violence Reduction Unit, a programme aimed at treating violent crime as a “public health issue”. Whilst this announcement is a definite step in the right direction, the initiative has been long overdue. The unit is based on a scheme in Glasgow where police work hand-in-hand with teachers, social workers and health professionals. They identify those most at risk of offending and offer them opportunities – in the form of jobs, housing, training or mentoring – to guide them away from violent crime. The scheme has seen the homicide rate in Glasgow halved in just over ten years. Both schemes are based on the long-term prevention of violent crime, treating the source of violence rather than its symptoms. Treating violent crime as a “public health issue” is finally a recognition of the fact that people who commit knife crimes have themselves been mistreated at a greater societal level. Knife crime is not a crime in isolation: it is a symptom of a chain reaction starting from systematic social alienation and exclusion.